Shouting is necessary because we’ve got good news over here: last week I took my most simplest and favoritest old fall-time cinnamon sugar apple cake recipe and made it into little – okay fine fine fine – HUGE whole wheat muffins. 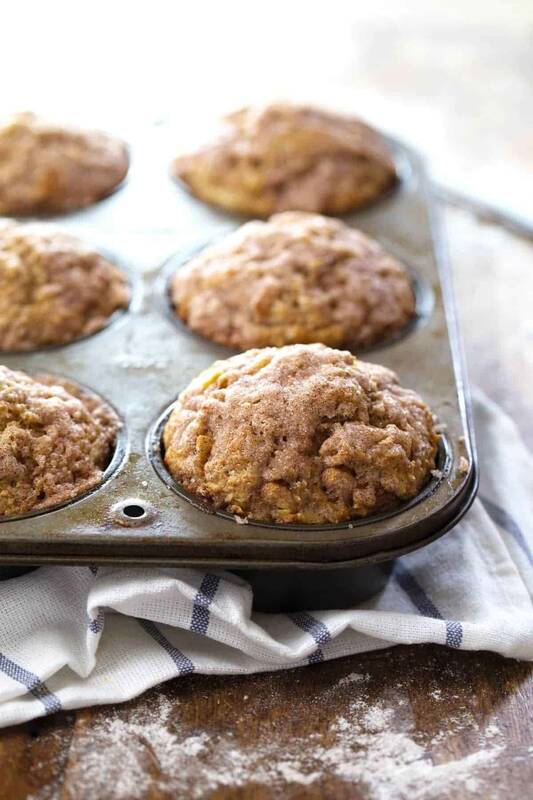 These pillowy beauties are not only mostly-good-for-you thanks to the whole wheat flour, coconut oil, less sugar, and deliciously sweet apple niblets in every happy bite, but also, and more importantly, they include a crunchy, delicate cinnamon sugar layer that is baked right into their adorable puffy tops. In my dream life, you would walk over here this morning because 1) fall morning walks are everything, and 2) you’d be my neighbor, obviously, and we would sit on my couch in only the most comfiest jeans and sweatshirts with messy bun top knots (okay okay, you can do your hair, but I’ll be having a messy bun top knot because I don’t know any other way) and we would ravenously eat warm cinnamon sugar apple muffins and slurp on big mugs of strong coffee + cream and talk about life, because talking about life means more long stories which means more time to eat muffins. Right from the start, there would be absolutely zero pretense about eating just one muffin- no way no how. But there would be lots of good feelings and generally delicious, cinnamon sugary muffinery going on up in the howwwwwse. This weekend I’ve been a muffin-making-machine because tomorrow (ahh! too soon!) Bjork and I are going on a local TV station to talk about things like pumpkin muffins and Pinch of Yum and Food Blogger Pro. Annnnnd I’m totally nervy because as much as I want to be kewl and brave and don’t-care-relaxed-all-the-time, the word Anxious with a capital A probably best describes how I am about life things in general. So I’m stuffing my face with muffins to dull the feelings, er, no no no, I meant practicing making the muffins so I can be a completely confident muffin-maker and normal person on live television. But maybe it’s a little of both. When we were at the State Fair this year, we tried to get on TV by standing behind the evening news anchors during their live broadcast. We were so far out of the literal spotlight that we were just dark blobs floating around in the nothingness of the background and absolutely no one could have seen us if even they tried. But you guys. They did the count down and then the news started and we just stood there in the pitch black and no one could see us in a million years and I COULDN’T EVEN BREATHE. Like, sweaty palms, racing heart, acting a little too goofy to overcompensate for the inner nervousness of just being within 20 feet of a live TV broadcast. I am honestly laughing right now. Am I really this person? Just… ugh. Gimme a muffin. When get our five seconds of TV fame on the local news tomorrow, I’ll be making some nice fallish pumpkin muffins, but it will be a tie for the muffins that I’ll be dreaming about in my mind: the pumpkies or these apple muffins. Because as much as I love pumpkin, sometimes the internet just overwhelms me with everything pumpkin ever. And at that point, a girl just needs some sweet and juicy fall apples in her life. Every fall we try to go to the apple orchard at least once to get apples and do all the cutesy stuff like ride around on the hay rides as adults with no children, stuff our faces silly with warm, fresh apple donuts, and take a series of selfies while safely hidden in the Honeycrisp row – hashtag appleorchard. This year we haven’t orcharded yet and I’m hoping it’s not too late because it’s one of my fave times of the year, and besides, it’s also usually the catalyst for the annual fall dream to buy a big house out in the country and let all of our little overall-wearing chilluns run free in the fields and live off of apples from the neighbors orchard. And I sort of love that dream. Even though this year’s apples were bought in a pre-packed large plastic bag at the closest possible chain grocery store and there have been no charming or romantic fall visits to the apple orchard, the yummy apple muffin smell was still the same as usual and the good feelings (cozy // fall // Christmas! never too soon.) still completely stopped me in my work-from-home tracks when I opened the oven and let that cinnamon sugar apple muffin wonderfulness just completely permeate every corner of our house. I could give you a whole long list of times and reasons and places that would be appropriate for making these muffins, but really, what needs to happen is you walking into the kitchen right now and scrolling down to see the recipe and experiencing the joy that is cinnamon sugar apple muffins in your mouth a-s-a-p. We don’t even need to discuss that any further. 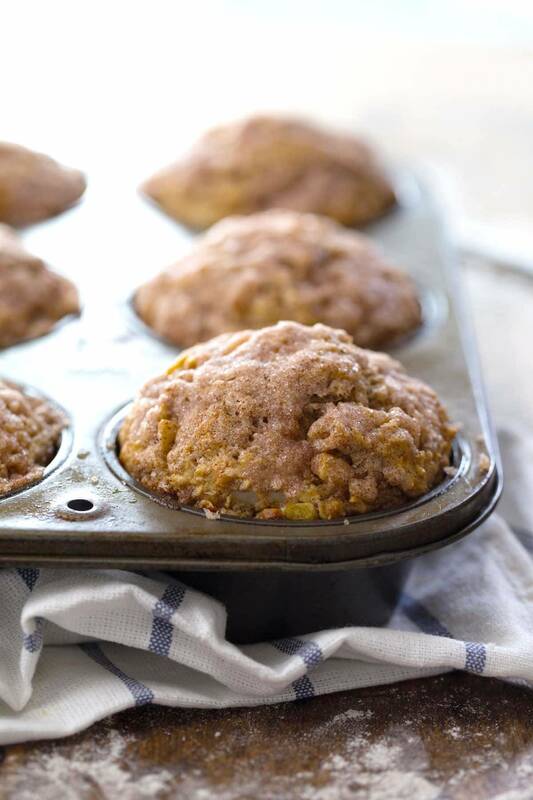 These Healthy Cinnamon Sugar Apple Muffins use whole wheat flour, coconut oil, and less sugar to make for a healthy, cozy fall treat! To prep ingredients: Microwave or heat the coconut oil until it’s liquified. Repeat the same process for the milk to bring it to room temperature. (If you don’t do this, the coconut oil will clump together when it mixes with the cold milk.) Add the vinegar to the milk and let it sit for a few minutes to turn into “buttermilk” – or just use real buttermilk instead! For the muffins: Preheat the oven to 350 degrees. In a large bowl, whisk the coconut oil, buttermilk, brown sugar, egg, and vanilla until smooth. Add the flours, baking soda, baking powder, salt, and allspice. Stir until just combined. Fold in the apples. Scoop the mixture into a greased or lined muffin tin – mini, regular, or jumbo sizes will all work. For the topping: Melt the butter for the topping. Add the sugar and cinnamon; spoon over the tops of the muffins. You only need a little bit to get the crunchy top effect, but if you love those crunchy cinnamon sugar tops, I’d suggest making twice or three times as much topping as what’s listed here. These are intended to be less sweet than a traditional muffin and very simply flavored. There is one teaspoon of allspice (which carries some cinnamony flavors) in the batter, but if you are looking for more flavor, add 1 teaspoon of cinnamon to the batter. Ok, so your live TV story made me have to leave a comment. I totally feel you, because when I was in high school, my friend and I volunteered to answer phones for a live televised PBS pledge drive. At first we were frozen in front of the cameras, but after about an hour, whenever we knew the camera was pointed in our area, we made a HUGE effort to be doing something on camera. Like pretend drinking water, frantically scribbling down information while “taking a call,” nodding furiuosly, etc. It was RIDICULOUS. But so funny now, looking back on it. Who lets a couple of teenagers answer phones on TV anyway? Also, these muffins look SO good, and I love the streusel topping. My favorite! Oh my gosh, LOVE that story! hahahaha! I have a feeling that I’ll be pretending to be so busy with my cooking that I’ll forget to look up. I’ve already been coaching myself – look up – look up – look up! You guys are too funny! I’m a pretty shy person, but I would probably be a camera-chaser too! These muffins look so good! They practically warmed me up and gave me that cozy fall feel just by looking at them! It was so dumb… like if I’m so nervous, why did we stand right in front of the camera and try to get on TV? Not my brightest moment. I kinda overdosed on cinnamon and apple muffins when I was in college. For around 8 years I couldn’t even look at them. You broke the spell with these. Yuuummmmm. It definitely felt like fall in Minneapolis this weekend and I was totally craving apples. I had to pick some up at the grocery store. I’ll have to pick up some more to make these! Also, good luck on TV! Made the switch to fall and pumpkin beers this weekend…. I guess it’s time for food to follow. This looks like a wonderful way to usher in the end of summer. Fall is nice, but I’ll be yearning for summer again in 2 weeks. I am literally laughing out loud. I would not put that sort of nervousness past me! We’ll see – fingers crossed for smooth moves tomorrow. I would be totally nervous if I was going on live TV! Good luck to you, I’m sure it will go amazingly! These muffins look completely wonderful! Love the apples and cinnamon-sugar topping! What I love more than these delicious-looking muffins is the fact that if you owned an orchard, you would have chiluns in overalls running amuck. Love that visual. Thanks Lisa! Fox 9 at 9:30! These look absolutely delish! Apple orchard visits are the best, but unfortunately my apples come out of a plastic bag too! Texas doesn’t really offer apple orchards :/ Good luck with your TV interview! Would love to see a clip soon! Mmm I definitely wouldn’t be able to stop at just one of these! Good luck on your TV experience 🙂 You guys will be fabulous! Cake into muffins is always a good idea. Yum! I’m totally with you on the more than one muffin rule–especially with beautifies like these! Can’t wait to have these on a fall morning with strong coffee. Good luck tomorrow! I’m looking forward to trying these when it cools down to fall temperatures in Texas. Thanks! These muffins look delicious! What a great idea for apple picking season…thanks for sharing! I was just thinking of my mom’s recipe for apple muffins a few days ago. 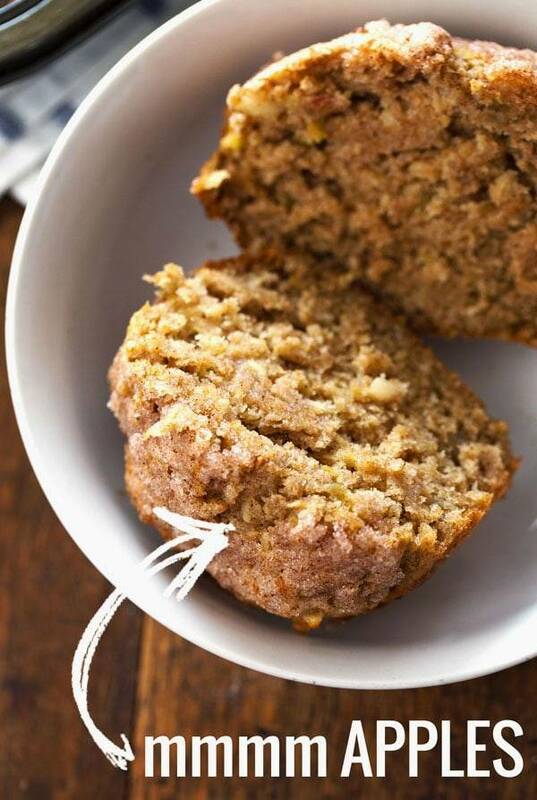 Apple muffins are the perfect fall recipe–these look delicious! I just shared some similar but sugar-free muffins that I made since I’m in the middle of Sugar-Free September. Can’t wait for October so I can enjoy that crunchy topping though, haha! Went to 2 orchards over the weekend with my kids, it’s my favorite time of the year by far! Is it possible to eat too much caramel? I don’t think so. Oh, and you’re not to late to visit the orchard. Great apples should be available until at least mid-late October. It’s a shame you went with store bought. There is a night a day difference between those and fresh apples off the orchard, especially, Honeycrisp, Zestar, Sweet Tango, or my new favorite River Belle. I highly recommend you try some of the local varieties, they will blow your mind. Can’t wait to make these for my little munchkins tonight! Could you use regular buttermilk? Was there a reason you used the vinegar and milk? Just because I didn’t have any. Buttermilk would be even better! How much of buttermilk should I use for this recipe? You should just replace the 1 cup of milk and 2 tbsp of vinegar, so those same amounts. Perrrrfect timing because Marc and I are headed to the apple orchard tomorrow. Also, we’re pretty much neighbors so you can come over and plop on our couch in your sweatpants any day to eat muffins, drink coffee, and chat 🙂 GOOD LUCK tomorrow….what channel are you going to be on?! I’m tuning in! haha that’s funny! I would have run from the camera 🙂 These muffins look so yummy! Good luck. I am sure you will be great. You just never know where blogging will take you. Apples and sugar and cinnamon! Coffee is on when can you be here? Perfect for this first chilly day! You and Bjork are amazing! You will wow them tomorrow!